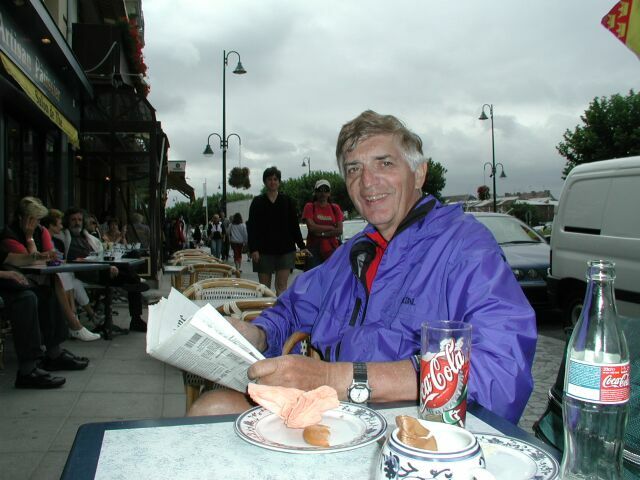 Once again the day started cool and cloudy with a breakfast consisting of coffee and croissant. The hotel dog was still on duty in front of the desk as we untangled and unlocked our bikes from the garage area in back. 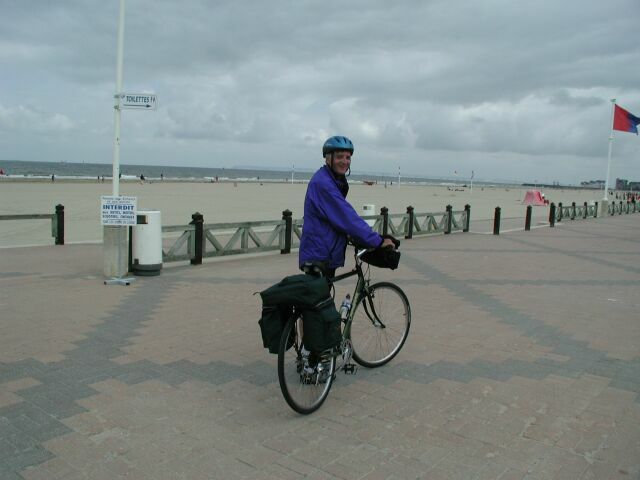 To get out of Cabourg we first headed away from the sea, then turned east and negotiated a couple of scary roundabouts before we crossed the river into Houlgate. I had the mistaken idea that we had finished all the tough hills on the trip. Today's route would take us along the coast, and somehow I assumed this would be flat. Len had warned me this wouldn't be the case, but I had the idea firmly in my head. The road out of Houlgate disabused me of this notion. There was a long, steep hill about a mile long and climbing from sea level to 410 feet. That may not seem much (and maybe not to "real" bikers), but it is a one in ten gradient for a rather long time. I should have known about this hill from the "viewpoint" marking indicated on the Michelin map. You don't get a scenic viewpoint without some appreciable climbing. I stopped a couple of times to get my breath, but eventually leveled out at the top. 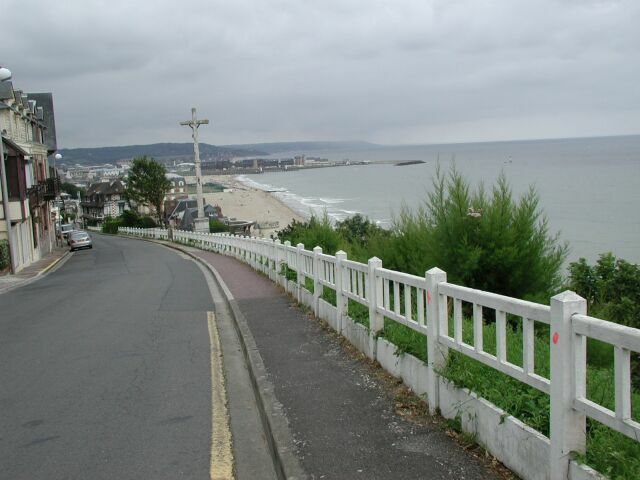 From there we had a breakneck descent down to the sea at Villers-sur-mer. 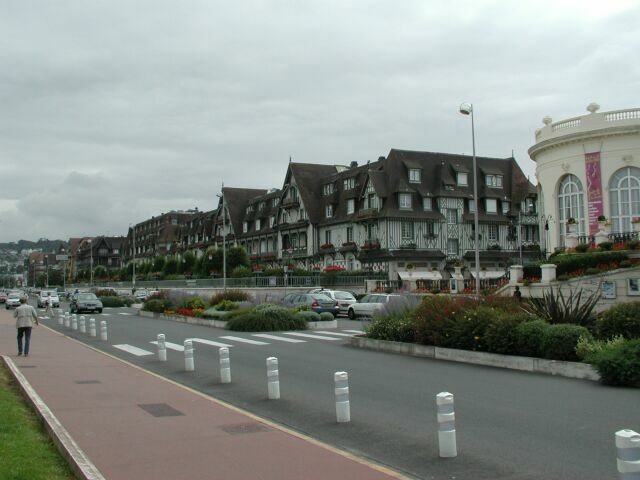 From Villers-sur-mer to Deauville was a built-up area along the sea with several large casinos. For a short while we were able to ride on a nice pathway that ran along the beach, but these things never lasted for long. Along the boardwalk in Villers-sur-mer we reached a point of special geographical significance where we passed through the line of zero longitude. 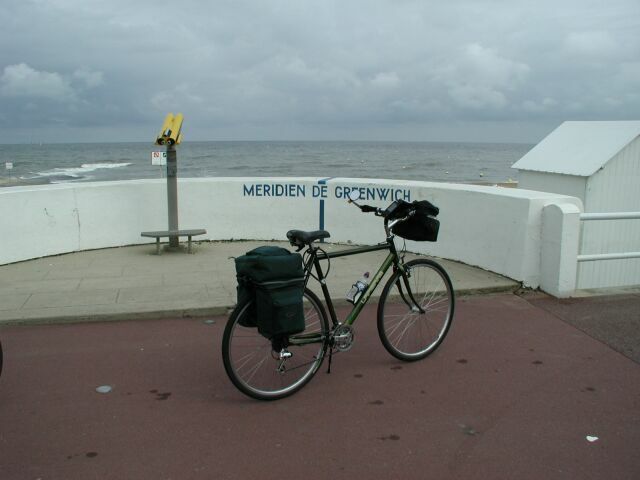 I watched the GPS on my handlebar as we approached the meridian. When I reached the line marked in this photo, my GPS said I still had about 30 feet to go. I pushed my bike forward until my GPS read 000000. It's a satisfying feeling, but I was a bit puzzled why the difference between the GPS and the line drawn on the pavement. My GPS was seeing a lot of satellites, and the positional error was indicated to be very small. I was wondering how they knew where to draw the line on the pavement, since they wouldn't have been able to use GPS at that time. I still wonder: which was more accurate? Stranger still, Len's GPS quit working as we crossed the meridien, and never really worked on the rest of the trip. Probably coincidental, but who knows? Deauville was elegant and rich-looking. For a while we could ride on the boardwalk, but not for long. There was a large casino on the sea as we approached the inlet to a river. Strangely, there aren't any cars in this picture, because as we approached the bridge the traffic was bad, and we had to negotiate two dangerous roundabouts while buses passed. 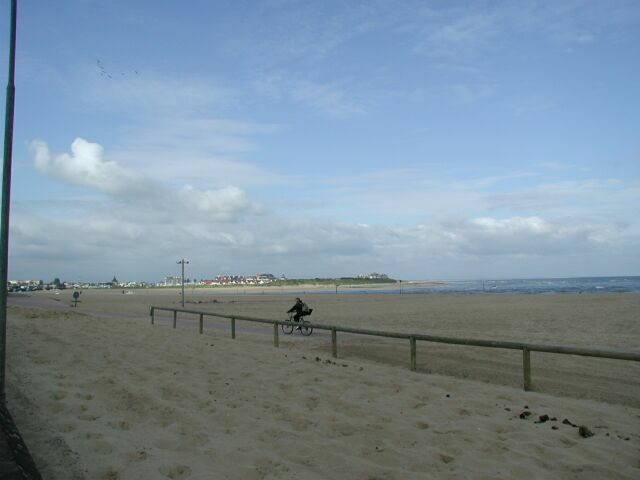 There were two bridges across the inlet, which was split, and on the other side the resort town of Trouville-sur-mer. Here there was a main street running down from the sea, lined with cafes. We locked our bikes and had lunch at an outdoor table. Here I was able to get a meringue for desert and eat it before it crumbled. Also, Len bought a Herald Tribune, and we got our first news of the outside world. It wasn't good. The market had tumbled, war was imminent, etc. 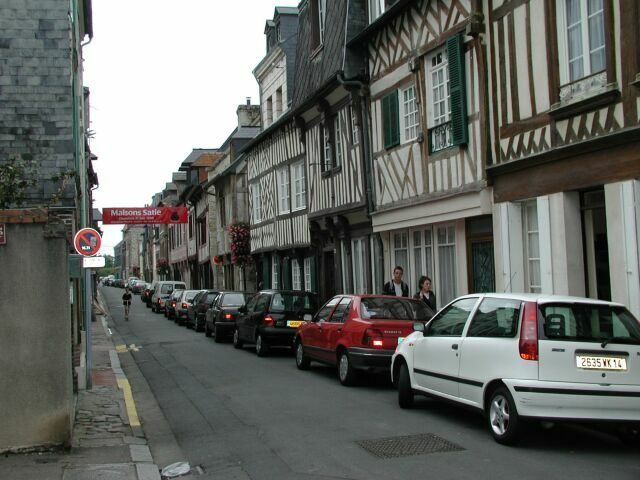 The road leading out of Trouville was named "Corniche". This brought images of a frightful climb, and it almost lived up to its name. I stopped to catch my breath halfway up and took this picture. From here there were rolling hills through wooded areas until we reached Honfleur. 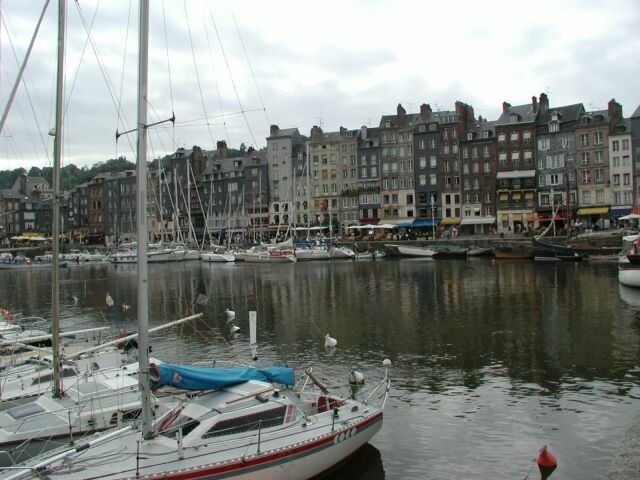 The harbor was practically the first thing we saw in Honfleur, and it was said to be beautiful. It was. We had a little trouble finding our hotel, which was on a square back to the left of this picture. There was a kind of bitter-sweetness about arriving there, because it was the end of our bike trip. We took our panniers off our bikes for the last time, and locked the bikes in the hotel lobby behind the desk. 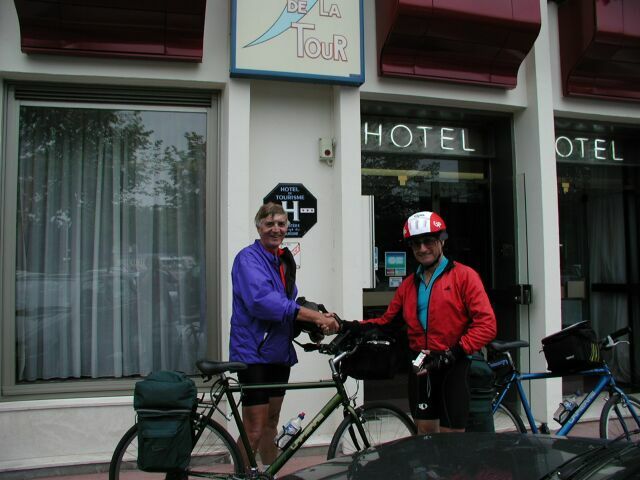 The desk clerk told us that the bike store had sent a van to collect our bikes a week ago, the same day they had delivered them in Dinan, 250 miles away. What a screwup! Then, of course, they had delivered the wrong things in Dinan. Later, after we had returned to the United States, the bike store claimed that the panniers weren't on the bikes when they had collected them from Honfleur. All in all, it seemed that they needed a better system. Nonetheless, we were really grateful about their service existing at all. We went out for a walk around Honfleur. There were pretty scenes everywhere, and we stopped to take many pictures. Here are a few samples. 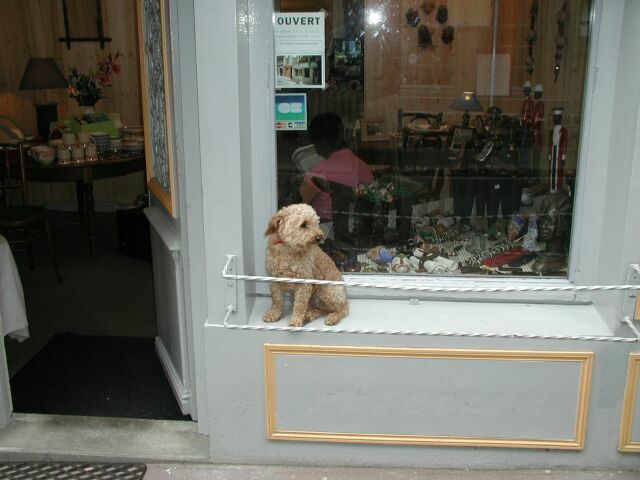 Scenes in Honfleur -- how much is that doggie in the window? 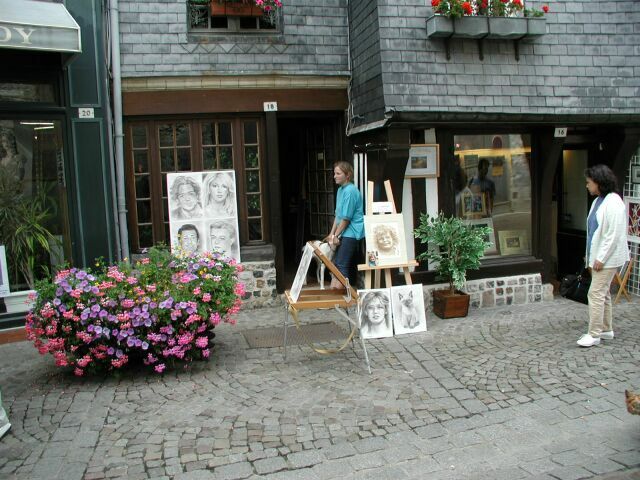 There were many art galleries, as the town was the home of a number of famous artists. 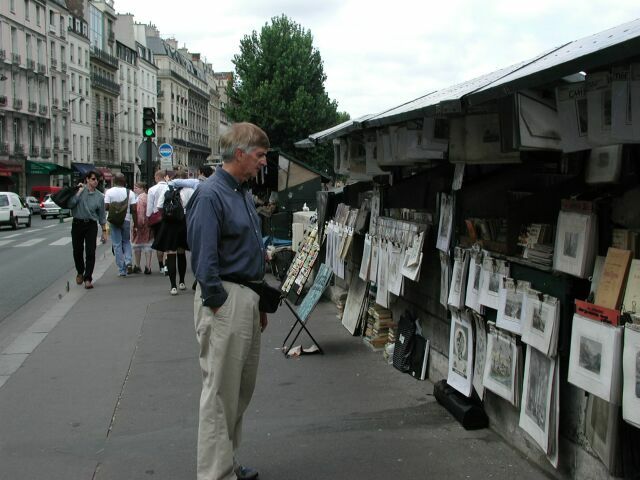 We were searching for the Erik Satie Museum which had been recommended in several guidebooks. We walked right past it without recognizing it, and then climbed steep stairs up to another street, where we happened on the Eugene Boudin Museum. We toured this museum, which had many impressionist paintings, and then once again set out looking for the Satie Museum. Down the stairs again, and we were directed to the museum, which was in the house where he had lived. The Satie Museum had unusual interactive exhibits, like rooms where the exhibits "talked" to you as you approached. There was an empty room with a white grand piano playing his compositions from a laser disk. We sat and listened for a while to the familiar pieces. I've played many of them myself, and I always thought there is a sameness to them. Like he invented one particular style, but it is unique. We gave a lot of consideration to what restaurant we would choose for dinner. We studied menus, consulted guidebooks, and peered inside at the ambiance. Finally, we chose one back of the square where our hotel was located. 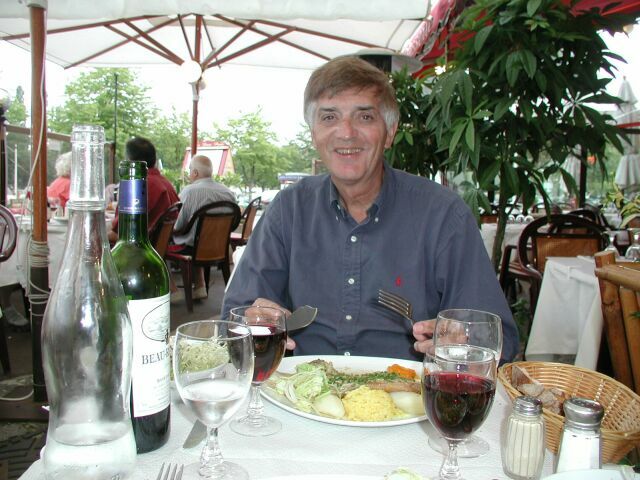 Here I am, enjoying the meal at the end of our trip. It looks really delicious to me now as I write this account! I had planned that we would end the trip in Honfleur, since this was across the harbor from Le Havre, where I was sure we could get a fast train to Paris. Not so, the desk clerk told us. We would have to return to Deauville to get a train to Paris. This seemed so unlikely that we went to the tourist bureau with the same question. We got the same answer. So the next morning we took a bus from the square back to Deauville. It took a different inland route, so at least we didn't retrace the same route that we had biked the day before. Nonetheless, it didn't seem right to be going backwards. We had a wonderful day in Paris, visiting once again the wonderful Musee d'Orsay, and sitting with an aperatif on the Boul Mich. But this web site is about biking, and many people have been to Paris. 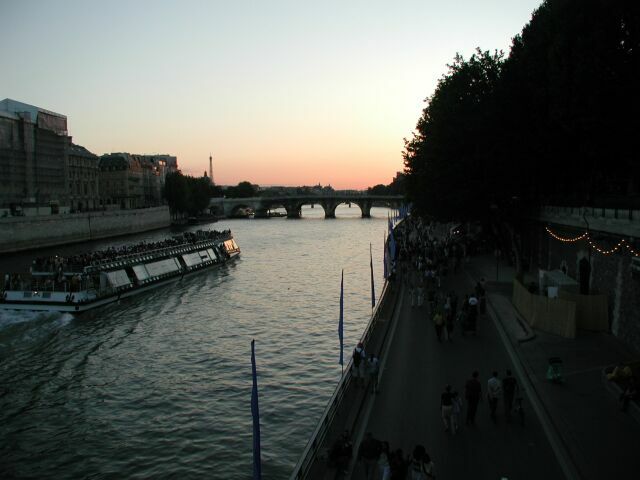 I'll close with two typical Parisian pictures to give the flavor, one stolling along the bookstalls, and the other as we walked back across the Seine at dusk.